In my original version of my weather station, the enclosure sat inside my greenhouse and was protected from the elements as well as being powered by electricity coming from the house. 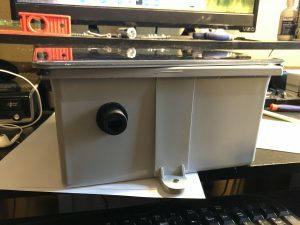 I’ve since gotten rid of the greenhouse and attempted to use a rubbermaid enclosure and purchased some solar power equipment to make it wireless. I had issues with the battery not lasting long in the winter time due to the reduced sunlight as well as the rubbermaid could not handle the elements. This has led to me not having my weather station for several years now. With a renewed interest, I am attempting a new enclosure and adding battery monitoring. I’ll be listing the parts that I’m using as well as linking to where you can purchase them. 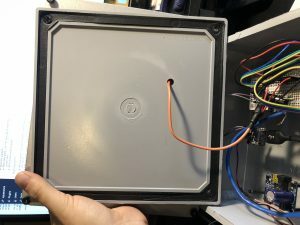 8″x8″x4″ Junction box from Lowe’s as main enclosure. As you can see above, the cable gland is placed on one side of the junction box, the solar panel requires a hole in the top to run the wire, but I use velcro to attach. (Have not placed the velcro on the lid of the junction box yet) The electronics are mounted to a piece of the clear acrylic sheet using the nylon standoffs arranged in a way that everything fits nicely. The battery sits underneath the acrylic sheet. There are some wires that come from the different hardware pieces that I wanted to call out now and will discuss more in the next post regarding the perma-proto board and the sensor communication with the Raspberry Pi. As you can see there is a cat 5 cable that runs from the cable gland to the perma-proto board. This is the communication from the mast. There are also two wires that come from the power boost to the perma-proto board. One is from the low battery indicator pin, and the other is the ground pin. Just a quick explanation of how this is wired. USB A to USB micro from the Powerboost 1000 to the raspberry pi. I used a small 6″ cable. 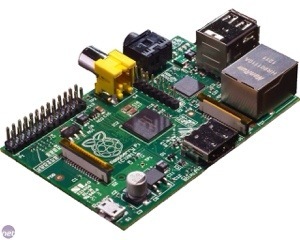 it will take a while before I post the Python code on the Pi. I am still testing/working on the code for the battery monitoring. Once I’m done, I’ll post it all here as well as on Github. It was too late last night when I finished the post about building the anemometer that I didn’t want to get into the code to read the wind speed. As I said before, basically what I do is I count the number of “triggers” within a 10 second period and then feed that into the formula that came from testing it with our car. Here is the code I use for Raspberry Pi…I run this every 5 minutes (with the rest of my measurements) to get the wind speed at that time. # This is the interrupt function. It opens a file, pulls the number from the file and adds one to it, then rewrites it to the file. # round it off to 1 decimal. I am actually in the middle of a redesign on my weather station due to the Raspberry Pi not being the best at interrupts for the rain gauge. 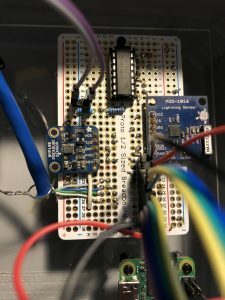 For the one at my father-in-laws farm, I will be using an Adafruit trinket to capture all the data from the anemometer, rain gauge, and wind direction sensor before relaying it to the Pi. 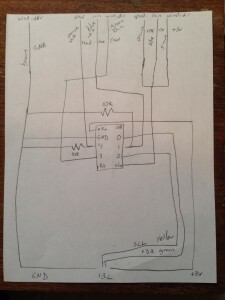 This type of sensing is better for a micro controller than it is for a Linux computer such as the Pi. For my home weather station, I’ll be using a Arduino Pro Mini as I have a lot more sensors on my mast. The Trinket code is a little more difficult due to the ATTiny85 that runs it. I’ll post info on how to connect it to a Raspberry Pi later. Here is the code for the same principal as above on a trinket. The big difference here is that this runs constantly. Every 10 seconds I have a wind speed reading, although I only pull it every 5 minutes. // on ATTiny85 trigger PCINT0 vector. I like projects! I NEED projects! I’ve wanted to do something in the wearables category for a while, but couldn’t think of something. I was out at the mall one evening with my beautiful wife looking through some of the department stores. I decided to call my sister-in-law (for a reason I can’t remember right now) and the idea popped into my head that I should make her some of the neopixel earrings I’ve seen in the Adafruit Learning System. So I told her I was going to make them and when I got home I went onto Adafruit’s site to purchase what I would need. I feel bad that I didn’t take pictures of the entire process, but it’s really, really simple. The first thing I did was shorten the battery leads. There’s no need for all that length of wire. 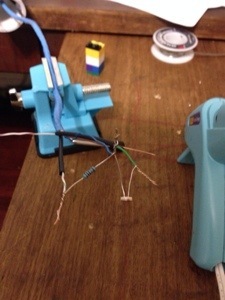 After that, I wired the Jewel to the Gemma with silicon wire with enough room to slide the battery between the 2. (They are back to back.) 3vo on the Gemma to +5V on the Jewel, Ground to Ground & D0 on the Gemma to input on the Jewel. To keep them together, I did a no-no and used hot glue. You slide the battery in position and make sure it all will align well (I aligned one of the mounting holes on the Jewel to D1 on the Gemma). Slightly lift the battery on one side so you have room to place the hot glue on the back side of the Gemma, then press the battery down into place. Repeat the same process with the Jewel on the battery making sure it’s aligned. For the code, I took what was given on the Adafruit tutorial for the ring earrings and modified it to only sparkle and to sparkle specifically in teal (my sister-in-law’s favorite color). case 0: // Random sparks – just one LED on at a time! 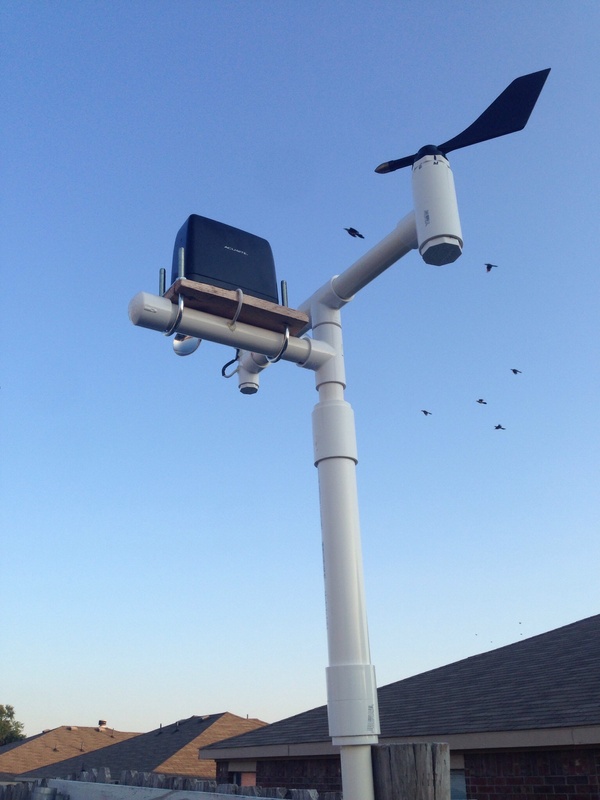 I finally completed migrating the weather sensors for the weather station that is at my father-in-law’s farm. 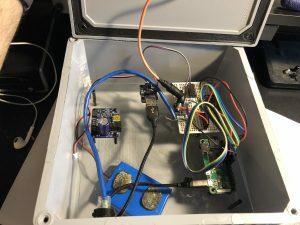 I had issues with the rain gauge not working too well with the pi directly, so I decided to use an Adafruit Trinket to capture the values of the sensors and send them to the pi for tracking. The communication between the two is accomplished using I2C. Here’s the completed mast with sensors attached. (This is actually a pic of it at my house for testing) What you’ll need for this is 1 of each of an anemometer, wind vane & rain gauge. It works with the sensors I built, but I’m sure you could incorporate it to use any sensors you have as well. I’ve used PVC to build all my sensors as it’s easy to connect together. In my anemometer & wind vane posts I have used certain PVC pieces to allow for connection to my mast. For the rain gauge, it’s a little different. I used a piece of cedar fence board to secure the sensor, then some u-bolts to attach the board to a 1 inch pvc pipe, plugged one end and drilled a hole for the wire to run through. 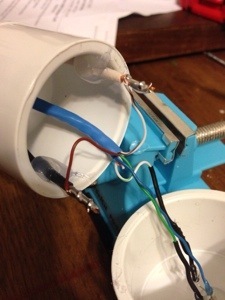 The lower mast is where the trinket comes in…I connect all the sensor wires to a single cat 5 cable to connect to trinket and then another wire for the I2C communication. The idea is to house the trinket in some 3/4″ pipe that is waterproofed and have it sit inside some 1 1/2″ pipe. (You can see this bulge in the pic above) I use some connectors to move from 1″ to 1 1/2″ pipe. Then a portion of 1 1/2″ pipe (I think it’s 12 inches long) and then connect it back to another 1″ piece of pipe to mount it. // Check for connection to be stopped. 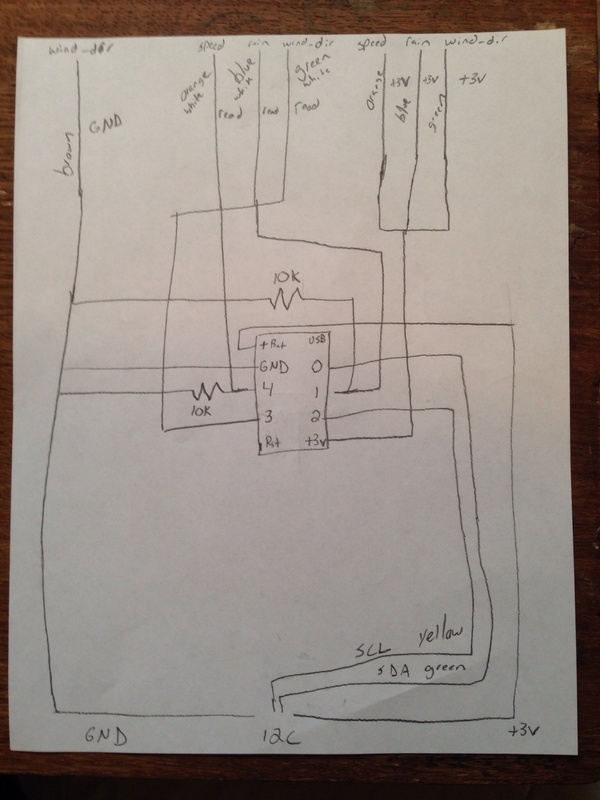 Here is the wiring diagram I drew out that shows how everything is connected. 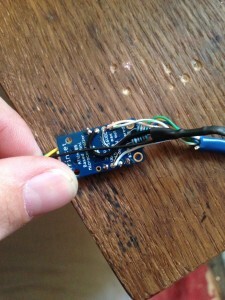 When connecting, make sure you use solder and shrink tube to protect the joints. 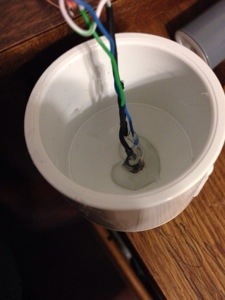 After all the wires are connected, drill a hole in a 3/4″ pvc plug and push the wire through that hole prior to connecting to the trinket. You may want to run it through a piece of 3/4″ pipe as well (about 8 or so inches). 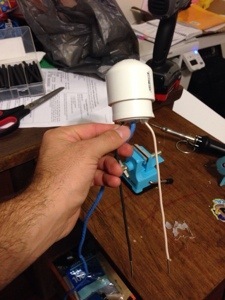 Place some hot glue on each plug where the wires go in to keep the water out, then shove this into the 1 1/2″ pvc pipe and then connect the rest of your mast. # Request values from device. Number is start register position. It doesn't seem that wordpress knows how to deal with indents in it's code sections, so make sure you indent it properly. Sometimes the trinket can give you some funny business which I've handled via the error trapping above. If you keep this bit of code you shouldn't run into any problems. 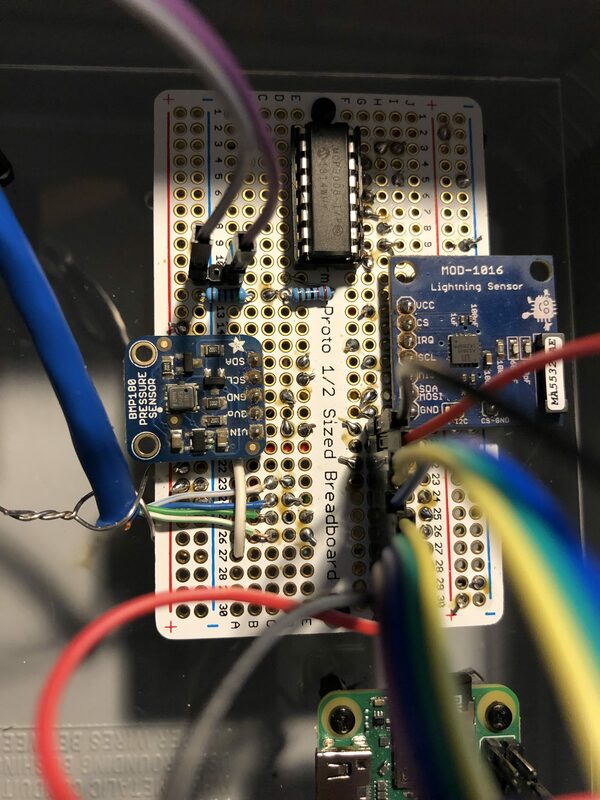 When they came in I had to test to make sure it was going to work, so I placed in the half size breadboard, wired up a TMP36 analog temp sensor, and connected the breadboard to my spare Pi. Well, come to find out, the driver I had didn’t work. Neither did the other one I found online nor the others I found. I was a bit depressed because I really wanted it to work. My last hope laid on the Adafruit forums. (Love Adafruit by the way!) I was a bit worried as they don’t sell the MCP3002 and they have messages on there about only supporting their products. So, reluctantly I posted a question on the forum asking if the driver they provide for the MCP3008 would work for the MCP3002. At first their people informed me that it would work, but I told them I had tested it and it didn’t. 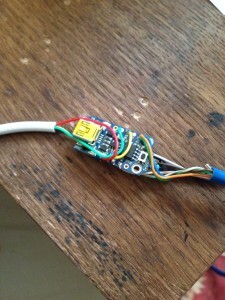 In one of my responses I made sure that I mentioned that I had wired it as per the datasheet and added a link. Come to find out, the reason their driver wouldn’t work is because the 3002 only wanted 4 bits sent to it for the request and the 3008 wanted 5. So, Rick (who I think works for Adafruit) helped with adapting that part of the driver. When I added his piece to the 3008 driver, it still didn’t work. I then took another look at the datasheet and found another difference in the 3008 vs the 3002. The 3002 only provided a 11 bit response vs the 12 that the 3008 provided. I then updated the code to account for that and voila! it worked like a charm. I know it’s been a while since I posted something, I guess it was just getting difficult to find time to post something after completing a sensor before bed. 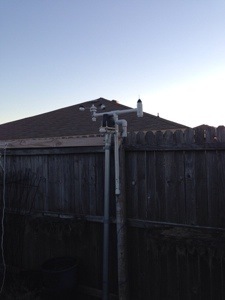 My most recent project has been building my own weather station. 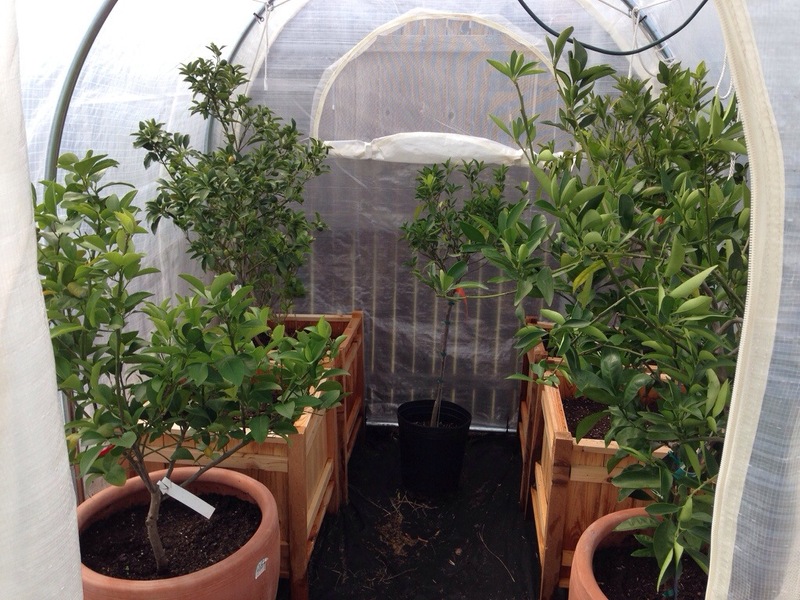 This sort of came from the greenhouse automation project. Once I was able to measure humidity, that was it; I wanted to measure everything else about the weather that I could. I’ve recently came to the understanding that I probably don’t need my automatic watering system nearly as much in the winter time, so I’m not in a rush anymore to get it built. When I will need it though is next summer. Now the fact that I need it most when I don’t have the cover on the greenhouse means that I need to find a way to waterproof everything. 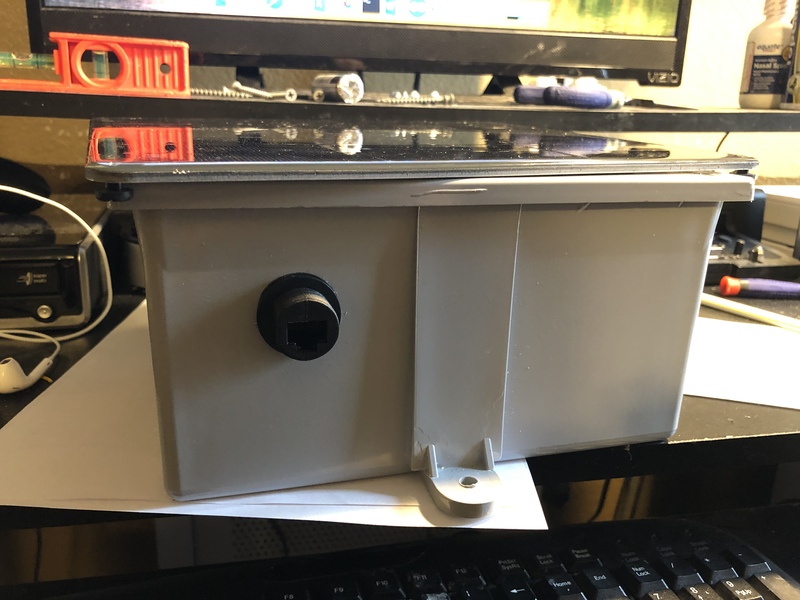 I’ve been looking into waterproof boxes I can put the computer in and have some ideas, but one of the other things I’ll need are waterproof moisture/light sensors for the trees. I had a revelation the other day that I can probably use some PVC to accomplish this. When I was at Lowes picking up the zip ties for the greenhouse, I went to the the plumbing section and found my parts. 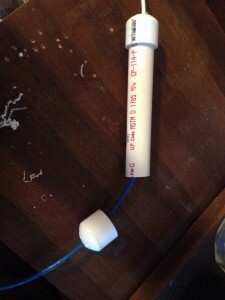 What you’ll need (besides many of the parts from the previous sensor) are a 1 1/2″ plug & a 1 1/2″ cap. (These should fit into each other.) The plug has a flat end and the cap has a rounded end. At first I had a hard time finding something that would work. I had planned on using some 1″ pipe with caps on either end, but I just didn’t think that the cap would be the right shape. When I was about to give up, I went back through one more time and found these!!! I was pretty excited that I found this combo. The first step to building this new sensor is to drill some holes in the cap and plug. 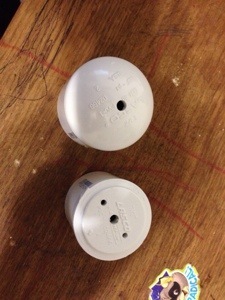 You’ll need to drill a 7/32″ hole in the middle of both the cap and the plug. 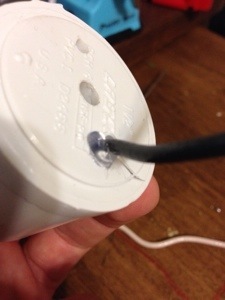 The plug also needs 2 1/8″ holes drilled on either side of the middle hole for the moisture sensor wire. The middle hole of the plug is for the cat 5 cable and the middle hole in the cap is for the light sensor. Again like the previous sensor, you’ll need to use some 12 gauge wire (10″ of romex is what I use). Remove some of the insulation from both sides like before and put some solder (tin) the side that will go into the dirt. 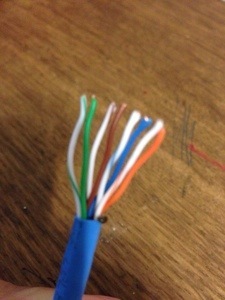 When this is complete you’ll need to make your wires look like the above picture. The way to do this is the put the wire through it’s hole and then press the end against the side of the plug and hold it there. While holding the inside, bend the outside. You’ll want the part of the wire that has the insulation removed to be above the end of the plug. (I think this is shown later). After you have the wires bent to the correct shape, you’ll need to “attach” the probes to the plug. 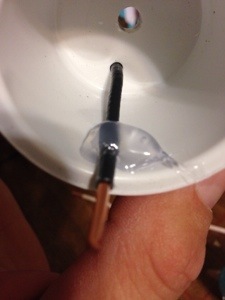 Put them through the hole and then place some hot glue at around the probe where it meets the hole. 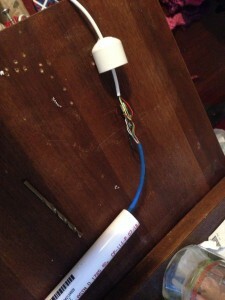 Next, flip the plug over and put a good amount of glue in the plug to hold the wire in place. (You can see in this picture how I said to place the part of the wire with the insulation removed above the top of the plug.) Do this with both sides one side at a time. The next step is really annoying. You need to place the LDR in the hole in the cap and secure it. 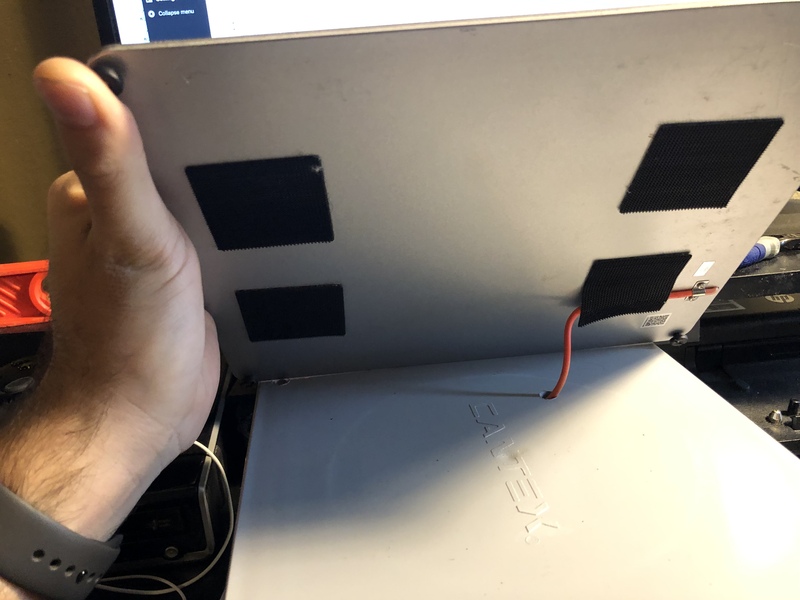 Do do this, I pushed the LDR through the hole and used some hot glue to tack it down. (Wait for it to dry so you have some hold.) Once it’s try, turn it over and place a lot of hot glue into the cap. 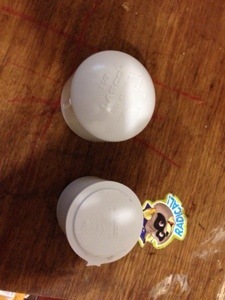 Let this dry, then fill in the holes around the LDR on the other side of the cap. (It took me 5 tries to get this right. Almost finished. 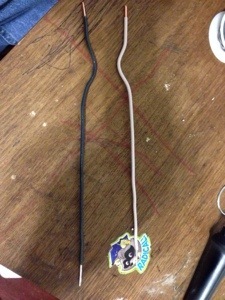 Lets solder the brown wire to the black probe and the brown/white wire to the white probe. Should be pretty easy if you gave yourself enough wire and placed the top of the probe above the top of the plug. After you finished this you can carefully press the plug inside the cap. 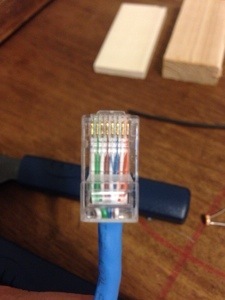 Once together, hot glue around where the cat 5 cable went enters the plug. For those who do not know, I have recently became a fan of Doctor Who, specifically the 11th doctor. (I have only watched episodes of the 11th, so I really can’t say I’m a fan of the others yet) Because of this I have decided to have a Halloween costume this year and I’ll be doing my best impression of the Doctor…. 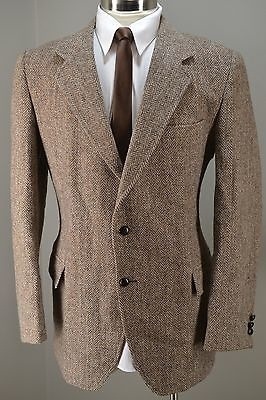 For the jacket, I was able to find a used Harris tweed jacket on ebay for around $40. Now the pattern is not exact, but Hey! it’s the same material and way better than any of those $50 knockoffs they sell at the costume sites. The shirt was probably not necessary as I could have just worn a white or cream shirt that I already have. 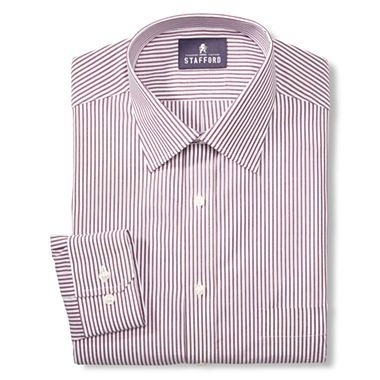 Now that I think about it, the stripes might be a little too much and I might make a decision to not wear the shirt depending on how I look once I try it all on. (Waiting for something to come in the mail…) Its not as though the shirt will be a lost cause though. I got it on sale for 40% off from JC Penny’s and I can add it to my weekly shirt rotation. 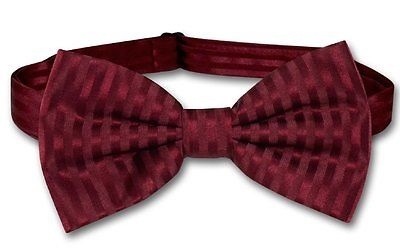 The bow tie…the most crucial part of the ensemble. Bow ties are cool and we actually have a bow tie day at work occasionally. (Usually on Thursdays) I found this one on eBay for about $7.50 with shipping. 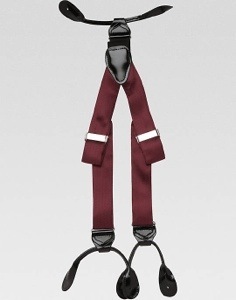 I really wanted a simple burgundy one and this fits the bill. 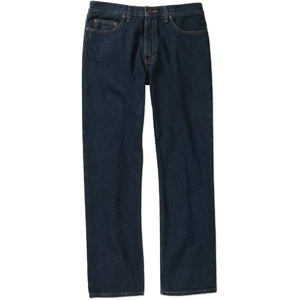 As for the jeans, I just picked up some cheap black faded glory ones from Wal-Mart for $10. Nothing too exciting. They are relaxed fit instead of skinny jeans though. 1. You’ll need to sign up for your own API from Weather Underground. # Prepare SQL query to INSERT a record into the database. sql = "INSERT INTO weather_tracking.weather_results (inside_temp, outside_temp, inside_humid, outside_humid, lux0_value, lux0_txt, moisture1_value, moisture1_txt, lux1_value, lux1_txt, moisture2_value, moisture2_txt, lux2_value, lux2_txt, moisture3_value, moisture3_txt, lux3_value, lux3_txt, moisture4_value, moisture4_txt, lux4_value, lux4_txt, moisture5_value, moisture5_txt, lux5_value, lux5_txt, moisture6_value, moisture6_txt, lux6_value, lux6_txt, pump_status, htr_status, moisture_count, moisture_alarm) VALUES (" + str(in_temp) + "," + str(out_temp) + "," +str(inhumid) + "," + str(out_humid) + "," + str(lux_sens0) + ",'" + str(lux0) + "'," + str(moisture_sens1) + ",'" + str(moisture1) + "'," + str(lux_sens1) + ",'" + str(lux1) + "'," + str(moisture_sens2) + ",'" + str(moisture2) + "'," + str(lux_sens2) + ",'" + str(lux2) + "'," + str(moisture_sens3) + ",'" + str(moisture3) + "'," + str(lux_sens3) + ",'" + str(lux3) + "'," + str(moisture_sens4) + ",'" + str(moisture4) + "'," + str(lux_sens4) + ",'" + str(lux4) + "'," + str(moisture_sens5) + ",'" + str(moisture5) + "'," + str(lux_sens5) + ",'" + str(lux5) + "'," + str(moisture_sens6) + ",'" + str(moisture6) + "'," + str(lux_sens6) + ",'" + str(lux6) + "','" + str(pump_status) + "','" + str(htr_status) + "'," + str(moisture_count) + ",'" + str(moisture_alarm) + "')"
# Fetch all the rows in a list of lists. # print "Error: Unable to Insert Data"
© 2019 Cup of Joe.